I wonder what it would take (if it’s even possible) to make that parking lot have even more food trucks, similar to what Portland has. Perhaps with a beer truck and benches. I don’t know how Portland is aloud to have their food trucks beer truck there permanently, but it seems to work out nicely. We certainly have enough trucks in this city, no? The city of Seattle is trying to be more accommodating to people opening food tucks but there are still permits, health codes etc. to deal with. It’s really up to the property owner to decide if they want to make space for the trucks, then for the trucks to take the steps to get their business financing, permits, etc. to make it happen. Obviously El Centro has decided this is a good use of their empty space until they build there and from talking to other neighbors it seems many of us agree so I expect this area may keep growing. Bottom line is that we all need to support these businesses with our regular trade to keep them viable. It’s also important for us to keep frequenting the “bricks and mortar” restaurants whose financial investment and longer term lease obligations are more significant. Keep dining out on Beacon Hill and bring friends from other neighborhoods to keep all our food establishments viable and successful and that’s how we will “make” it happen! :). El Sabroso is really good. 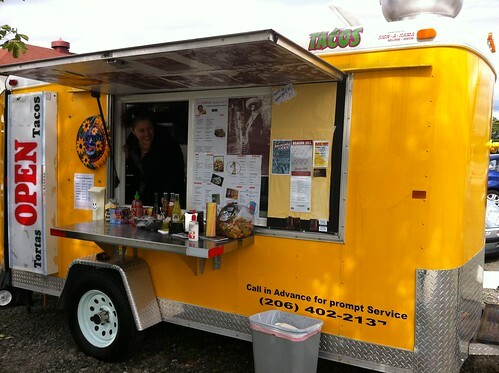 It’s some of the best taco truck food I’ve had anywhere in Seattle. I guess you’ve got to be good if you are going to open a taco trailer in a neighborhood that already has 5 Mexican restaurants on its commercial strip. The shrimp and fish tacos were excellent. The tortas look good too. Definitely try it. You will not regret it. I went to El Sabroso too. The food was good. But I would like to see bigger portions or the option of buying a larger size or something. I had one quesidilla and afterward felt that I could eat another two easily. I find that two fish tacos makes a perfect meal for me, but I am a small eater. Incidentally I have noticed that the hot dog cart has been there other times this week as well. Not sure yet if this is a regular thing or not, but it’s pretty cool to have these options on a regular basis. My only comment is I hope El Sabroso comes up with something a little more visually pleasing than the new blue tarp awning thing they recently rigged up. It looks bad now and will only degrade/look worse in the future. Beacon Hill is known for many embarrassing examples of very cheap construction but I was hoping the third world look was a thing of the past. El Sabroso is great! Do they really close at 3? Seems like folks getting off the light rail from 5 to 7 would be the main target market. Anyway the kids meal option is a great deal and the torta is filling and tasty. El Sabroso says they close at “three-ish” but the times do seem to vary. I agree, they could make money during the after work rush! I peeked at El Sabroso’s sign today and now they say they close at 7! But they were closed today. Yes, would be awesome for more food trucks to open up there in the ElCentro parking lot. 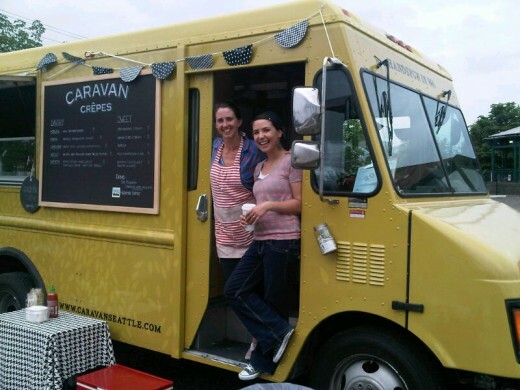 I wish the Crepe truck was there more often then just Saturdays! I’ve walked up several times now to try El Sabroso and it has been closed. Disappointing.